Institute of Hotel Management Catering Technology & Applied Nutrition, Jaipur is amongst the 21 IHM that comes under National Council for Hotel Management and Catering Technology. NCHMCT works for the development of hospitality education all over India. The Institute of IHM, Jaipur was started in 1976 and was formerly known as Food Craft Institute. Later on it was upgraded and now comes under both Indian Government and Government of Rajasthan. The Institute offer various courses to the candidates including B.Sc. in Hospitality and Hotel Administration. Due to an MOU is signed between NCHMCT and Indira Gandhi National Open University, New Delhi, the B.Sc. course is conducted by NCHMCT and is awarded by IGNOU. The admission to IHM, Jaipur is done through NCHM Joint Entrance Exam, which is conducted by the exam authority of NCHMCT in the month of April. The candidates who are looking forward for B.Sc. in Hospitality and Hotel Administration are required to fill the application form for NCHM JEE. The application form for the exam is available from December to April. The applicant can get the form in both online and offline mode. The candidate is required to fill the form and paste their passport size photograph on the space provided in the form and send it to NCHMCT office, Noida through registered post/speed post. The form will not be accepted if sent through any other private post/courier. The candidate will only be allowed to sit for the exam if he/she comes under the age criteria given by NCHMCT. The candidate should not be more than 22 years of age in case of General/OBC and 25 years in case of SC/ST/PD. The admit card for NCHM JEE is available in online mode only. The students can download it from NCHM JEE website. No offline admit card is being sent to any students by National Council for Hotel Management and Catering Technology exam conducting authority. Students will not be allowed to sit for the exam without admit card. Each student should carry 2 copy of admit card with them as one copy is given/submitted at exam hall and other is kept by the candidate. 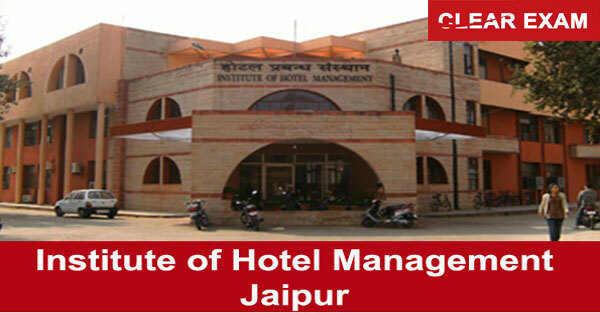 The Institute of Hotel Management, Jaipur aims to provide best possible technical assistance and training experience to students with facilities like Basic Training Kitchen, Quantity Training Kitchen, Advanced Training Kitchen, Training Restaurants, Bakery, Computer Lab, Front Office Lab, Housekeeping Lab and many more. To get latest updates and information on Hotel Management colleges, exams, syllabus, important dates etc. read Success Mantra’s latest articles on Hotel Management.